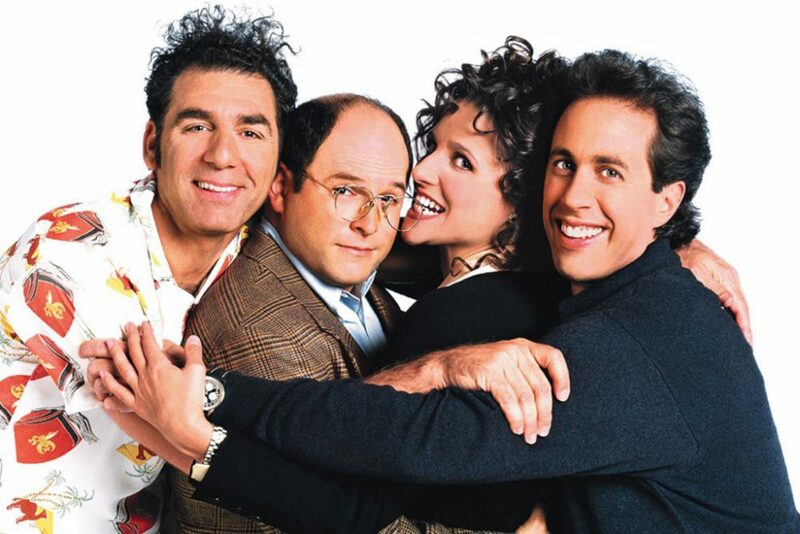 Nineteen years after it went off the air, the sitcom "Seinfeld" still has a devoted following of viewers around the world. Jennifer Keishin Armstrong (@jmkarmstrong) writes about the show's popularity in "Seinfeldia: How A Show About Nothing Changed Everything." Here & Now's Jeremy Hobson spoke with Armstrong last year about why "Seinfeld" was such a game-changer. Three women in big hair and flowered dresses—PLUS another in jeans—convulsed on the grass near third base. Earth, Wind & Fire’s “Shining Star” pumped through the speakers of the Brooklyn Cyclones’ minor league stadium for the world’s most herky-jerky dance-off. Only one woman could be crowned the Best Elaine. They writhed and spasmed as if their lives depended on it. And this was exactly what the sold-out crowd of 7,500 spectators had come for. The baseball game was beside the point. Inside, a lanky seventy-one-year-old with a backward baseball cap over his gray curls hocked ASSMAN license plates and MASTER OF MY DOMAIN sweatshirts. Among the many who threw out “first” pitches: an importer/exporter, postal workers, architects, a latex salesman, and a New York resident named George Costanza. If you do not understand why this procession of individuals was chosen, you did not belong at this game. This bizarre parade of nonsensical characters and references made plenty of sense to those who had clamored for the tickets. It was Seinfeld appreciation night, and it was packed with activities that brought the show’s trademark bouillabaisse of cultural references and inside jokes to life. The aspiring Elaines were reenacting the 1996 episode in which Elaine—the only woman among the four main characters, and the only one with any clear career ambition—loses the respect of her employees when she dances absurdly at a work function. Vandelay Industries is the company that George, the balding schlub with a deficit of ambition, pretends to work for. Keith Hernandez famously played himself in a 1992 episode, becoming a sore point between Jerry, the show’s main character, and Elaine, who ends up dating Jerry’s longtime idol. Never mind that this show went off the air sixteen years earlier. The game sold out weeks in advance, and the vast majority of the crowd was not there for baseball. Few people left even as the score shot farther and farther out of the Cyclones’ favor, ending up at an 18–2 blowout. That’s because almost every nonbaseball moment was filled with something far more fun: a Junior Mint toss, a cereal-eating contest, a marble-rye fishing race, a pick-or-scratch contest. In a presumable coincidence, the women’s restrooms ran low on toilet paper. Some fans reenacted the “Can you spare a square?” Seinfeld moment, whether they wanted to or not, giggling knowingly. Fans carried giant cutouts of Seinfeld’s and Hernandez’s faces. One guy dressed like Kramer, with a bushy wig and a pipe. Another wore a jersey with the name KOKO on the back, an obscure reference to George’s least-favorite office nickname. Several puffy shirts of the kind Jerry once reluctantly wore appeared throughout the crowd, and on the team’s seagull mascot. Emily Donati, who had traveled nearly a hundred miles from Philadelphia to be there, had VANDELAY INDUSTRIES business cards printed up, with the fake e-mail address importer@exporter.gov and the tagline . . . AND YOU WANT ME TO BE YOUR LATEX SALESMAN! She passed them out to appreciative fellow fans throughout the day. Fans preferred talking Seinfeld with one another to watching the increasingly horrific game. By the fifth inning (score: 16–0), they were mostly concerned about how much longer they’d have to wait before the end of the game so they could participate in the promised postgame extravaganza: Every fan who wished to could run the bases, and people named Jerry got to go first. This particularly consumed Jerry Kallarakkal. He’d gone to get a wristband that would allow him to the front of the line, but the woman hadn’t even asked him for an ID. And they’d run out of wristbands, so she gave him a stick-on name tag that said JERRY. What kind of operation was this? Surely there would be hundreds of fake Jerrys out on that field after the game. Then again, the boundaries between “real” and “fake” had dissolved long before this incident. SEINFELD HAS A SPECIAL KIND OF MAGIC. The Cyclones’ Seinfeld gambit was so successful that five months later, a minor-league hockey team, the Condors, of Bakersfield, California, had its own Seinfeld-themed night, with the players wearing puffy shirt–style jerseys. And the Cyclones planned another Seinfeld night for summer 2015, packed with still more references: Kramer’s Technicolor Dreamcoat jerseys, a muffin-top-popping competition, a trash-eating competition . . .
Like those who filled the Cyclones’ stadium in 2014, every fan thinks he or she is the biggest Seinfeld fan. Like those 7,500 fans, many Seinfeld acolytes share an urge to express their fandom in some grand, public way; specifically, to interact in real life with the fictional world it created. Seinfeld created more ways to do that, more portals between its fictional world and reality, than the average show. Knowing Elaine’s dance, or the Keith Hernandez joke, or the “master of my domain” joke, is like knowing a secret password—a very widely known secret password—among the show’s fans. Coming to “Vandelay Industries Park” that day allowed those 7,500 fans not only to reach out to other fans but also to interact with the very object of their fandom. They could meet the Soup Nazi or the “real Kramer.” They could be George or Jerry or Elaine or Kramer. They could, in fact, be all of them in the same day. It is a place that the show’s creators, Larry David and Jerry Seinfeld, constructed themselves, even if they didn’t realize it at the time, when they blurred the boundaries between their fictions and reality like no show before Seinfeld did. (Is the comedian named Jerry Seinfeld on the show the same as the comedian named Jerry Seinfeld who plays him? Are the real New York places depicted on Seinfeld as filled with crazy characters and antics as they are on television? Is Seinfeld the “show about nothing” that Jerry and his friend George pitch to fictional NBC executives in the show’s fourth season?) Seinfeldia is a place that now carries on, as vital as ever, without its original architects, thanks to incessant syndicated reruns that continue to gain new generations of fans and a religious fan base bent on ritually resurrecting the show’s touchstone moments via cocktail-party quote recitations. This show that officially ended in 1998 still, almost two decades later, draws crowds to bus tours of its sites and ultracompetitive trivia contests about its minutiae. In 2014, the most anticipated Super Bowl commercial featured Jerry and George chatting at a coffee shop as if no time had passed. Seinfeld has continued to survive in the most exciting—and precarious—time in television since the medium’s invention. By now, the show has been off the air almost twice as long as it was on the air, and yet it lives on like no other television series. Thus it continues to bring in millions of dollars in syndication fees and advertising revenue every year—$3.1 billion total between its 1998 finale and 2014. In 2015, streaming video service Hulu won an intense bidding war for rights to the show, offering a reported $160 million to bring it to a new generation of viewers. The history of Seinfeld is not complete, and may never be. It is the story of two men whose sitcom—full of minute observations and despicable characters—snuck through the network system to become a hit that changed TV’s most cherished rules; from then on, anti-heroes would rise to prominence, unique voices would invade the airwaves, and the creative forces behind shows would often gain as much power and fame as the faces in front of the cameras. Seinfeld’s story is the story of the rise of fan culture, and Internet communion among those fans, starting from the web’s nascent days. It is the story of television gaining respect as an art form and the subject of serious academic study. It is the story of one show that has defied the odds again and again, then a few more times still, to remain a vibrant force in everyday life, in ways mundane and strange alike. It is a story still playing out every day here in Seinfeldia. But it is, of course, a story that starts with that of its founders, Larry David and Jerry Seinfeld, and the people who helped them build it. This is that story. Excerpted from the book SEINFELDIA by Jennifer Keishin Armstrong. Copyright © 2016 by Jennifer Keishin Armstrong. Reprinted with permission of Simon & Schuster. This segment aired on June 7, 2017. Seinfeld Goes Online, But Who Will Watch?